What is known today as curing is a modern refinement of the ancient process of meat salting, a method of preservation used for centuries to keep families fed through the winter months. These days our quality bacon can be either "Dry Cured" with a salt based mixture or "Wet Cured" through immersion in a liquid brine. Almost all are available smoked or unsmoked – it is simply a matter of personal preference. 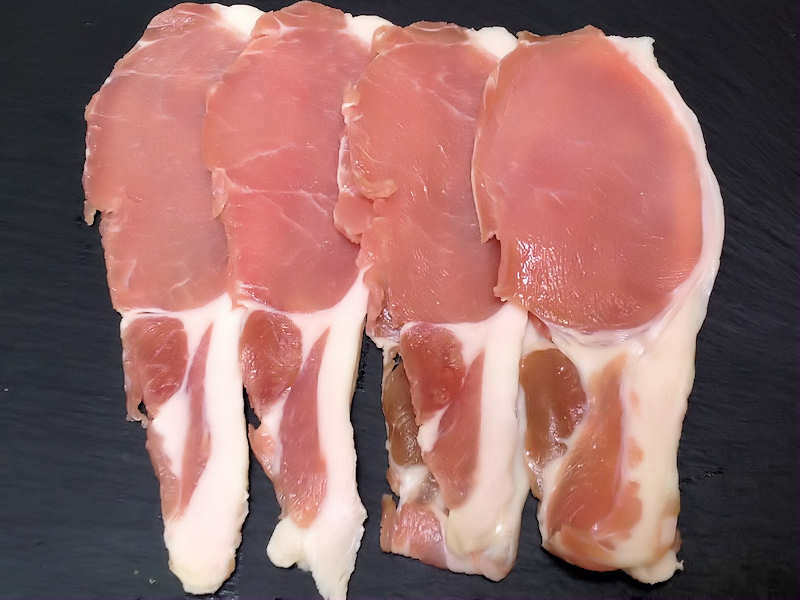 From classic Dry Cure through to Wiltshire Cure and all the Smoked variations, the choice of quality bacon available today is varied and delicious, providing a fantastic array of tastes and textures to bring to the table. But where to start? When it comes to choosing the right cure for the right eating occasion the variety of choice can be mindboggling. Here we aim to educate, advise and enlighten with our connoisseur’s guide to the essential bacon cures. Here are the standard methods of curing bacon. Of the two most recognised methods of curing, Dry Cure and Wet Cure, this is the oldest. Traditionally farmhouses would adopt their own, distinct recipe, apply the ingredients to the meat and hang it in the inglenook above the fireplace. Dry cured bacon was also a key ingredient in the rations sent aboard ship for long distance sea journeys. Today, whilst individual recipes are many and varied (and often jealously guarded secrets), traditional dry-curing still involves the time-consuming process which requires each cut of pork to be hand rubbed with a sea salt based mix (to ensure a delicate flavour) and then cured for at least five days (depending on the size of pork). The meat is then matured and air-dried for up to 20 days before finally being ready to eat. 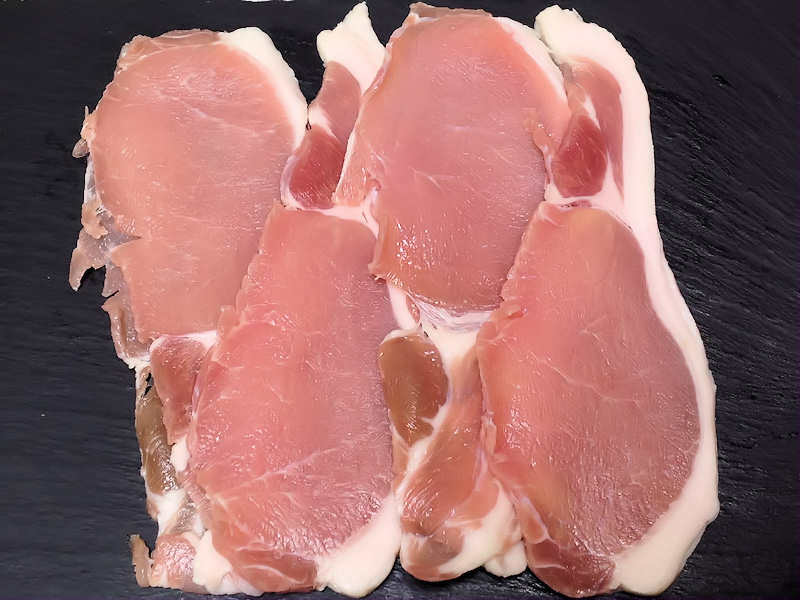 The dry curing process expels water from the pork which means that the bacon shrinks less whilst cooking and shouldn’t exude any "white bits" in the pan. The gentle flavour and taste of Dry Cured Bacon is ideal for use in the beloved English breakfast and the iconic bacon sarnie. Perfect too in salads, where the mild flavour will inject a frisson of taste. 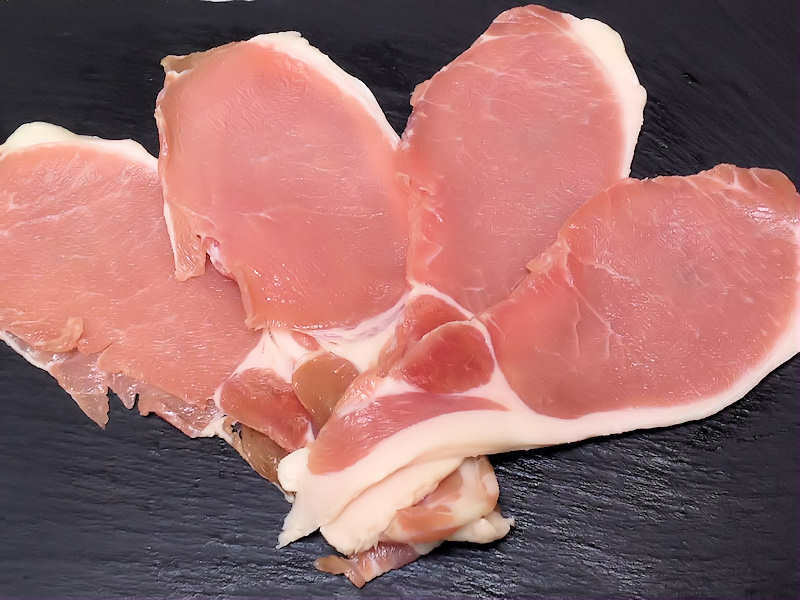 With its delicate flavour, making it particularly suitable for families, Dry Cure is known lovingly as "bacon as it used to taste". As its name suggests Maple Curing involves the addition of maple syrup to the curing mixture - either as part of the external rub, as in the case of a dry cure - or as an added ingredient to the brine in the wet cured version. The rich syrup is then drawn into the meat during the curing process of up to five days, giving the bacon its distinctive sweet caramelised flavour. The cured bacon is then often smoked to add an increased depth of flavour. Smoky and woody with a sweet aroma, Maple Cured bacon is an indulgent, mouth watering treat. Its unique, intense character makes it more suitable as the centrepiece of the meal, rather than as an ingredient, where it could swamp other flavours. Perfect for an indulgent brunch or a five star bacon sandwich. Sugars of varying kinds, such as Muscavado, Demerara or Molasses are the dominant feature of Sweet Cure bacon. Spices such as juniper are also sometimes added for extra flavour. The curing process follows the same key principles as for the basic dry or wet cure, but the addition of sugar as the leading feature of the cure results in mouth-watering, moreish bacon with a flavoursome aroma and smoky, syrupy notes.A popular bacon, Sweet Cure will help to elevate any meal such as pasta or pizzas. Its recognisable taste also makes Sweet Cure more appealing to adults - especially for sandwiches and salads. Smoking is not a cure in itself, rather the smoking process that occurs after the bacon has been cured to give an added flavour hit. Whilst today smoking can involve coating bacon in a ‘smoke flavour’ liquid to gain the authentic flavour, quality smoked bacon is usually produced in the more traditional fashion, by smoking over wood chippings. Of these there are many variations, such as Cherry, Applewood, Beech and Hickory to name but a few. One of the most popular is Oak Smoked. Oak Smoked bacon has a rich aroma that gives way to a surprisingly mellow flavour. A predominantly smoky, slightly salty aftertaste is characteristic of this bacon. Succulent and moreish, Oak Smoked bacon has an earthy flavour that complements a mix of ingredients in a variety of recipes without overpowering them. Good for sandwiches and suppertime meals, Oak Smoked is a real family favourite. And here I've put a break down on all the rashers of bacon available. 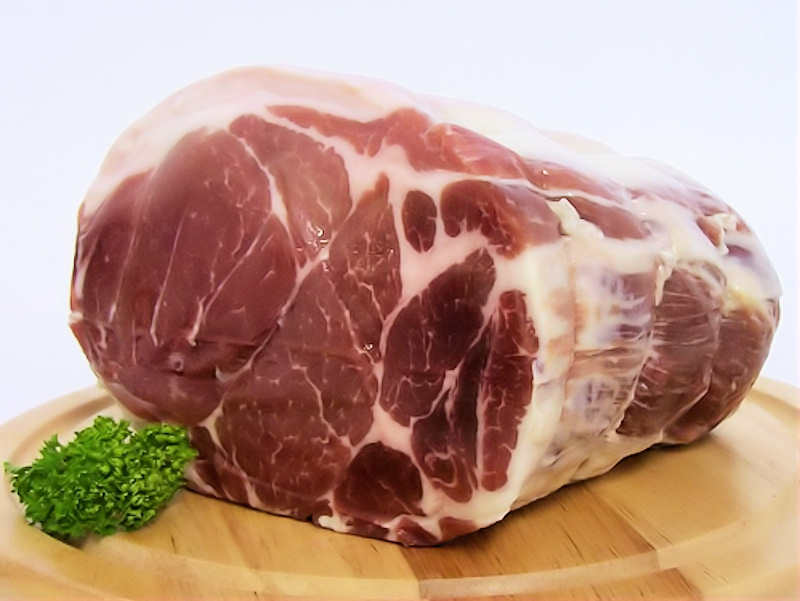 All the sliced rashers differ, depending on the cut from which they are prepared. Streaky bacon - comes from pork belly. It can be quite fatty with the layers of fat running parallel to the rind and meat. A popular favourite, it is tasty and best grilled. 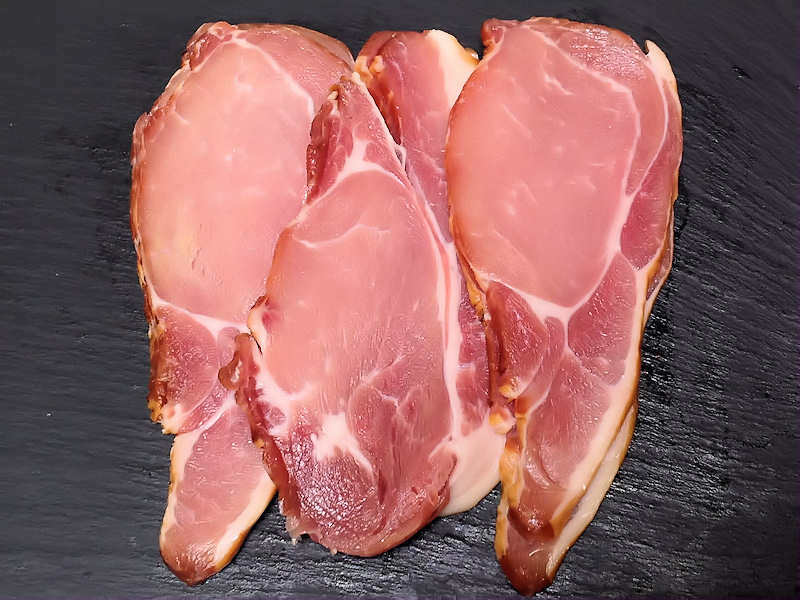 Middle bacon - from the side of the animal, after streaky and back bacon, is an economical buy and a great breakfast favourite . 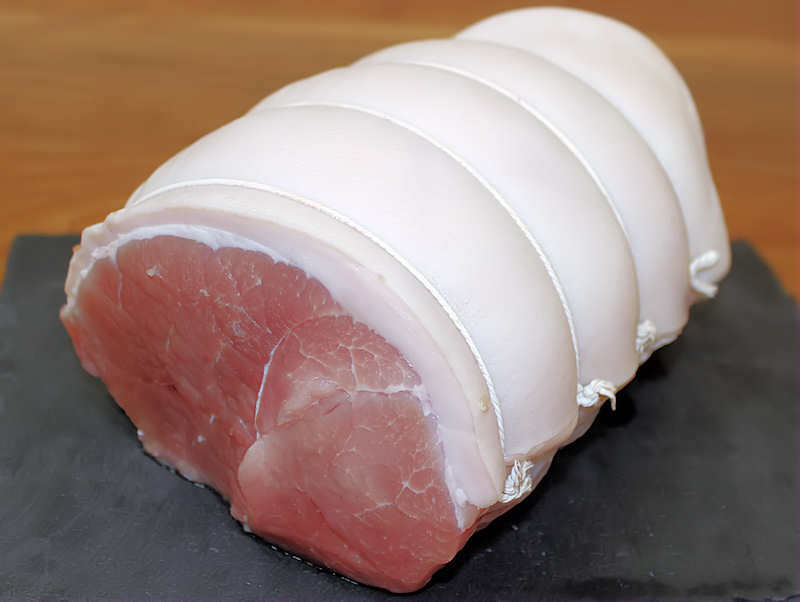 Back bacon - comes from the loin in the middle of the back of the pig. It is a very lean, meaty cut of bacon, with less fat compared to other cuts. It has a ham-like texture. Most bacon consumed in the United Kingdom is back bacon. Collar bacon is taken from just below the neck of a pig, and can be sliced in to rashers. From the ankle joint between the ham and the foot and is great for casseroles, soups, pies and mincing. 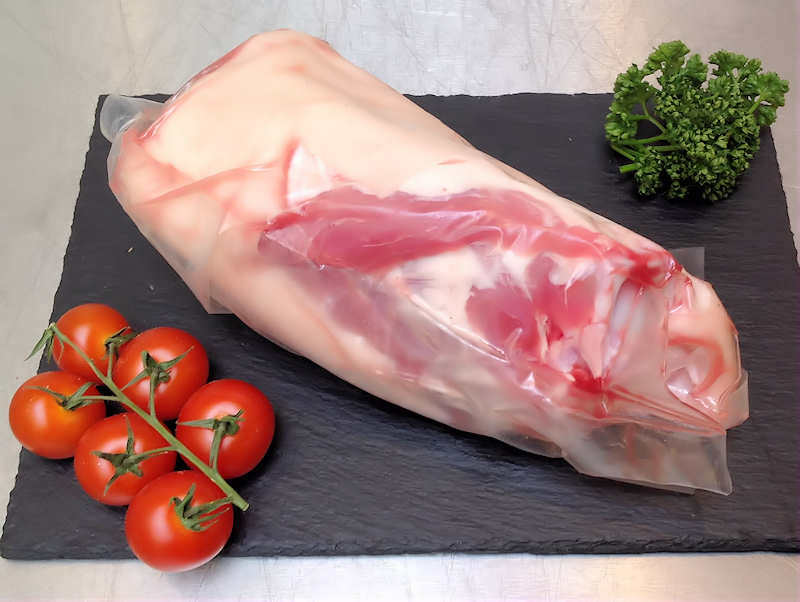 From the hind leg, traditionally "Wiltshire cured" is a lean meaty cut and a prime joint for boiling, braising or roasting. Gammon rashers or steaks are also cut from here, which are excellent grilled or fried.